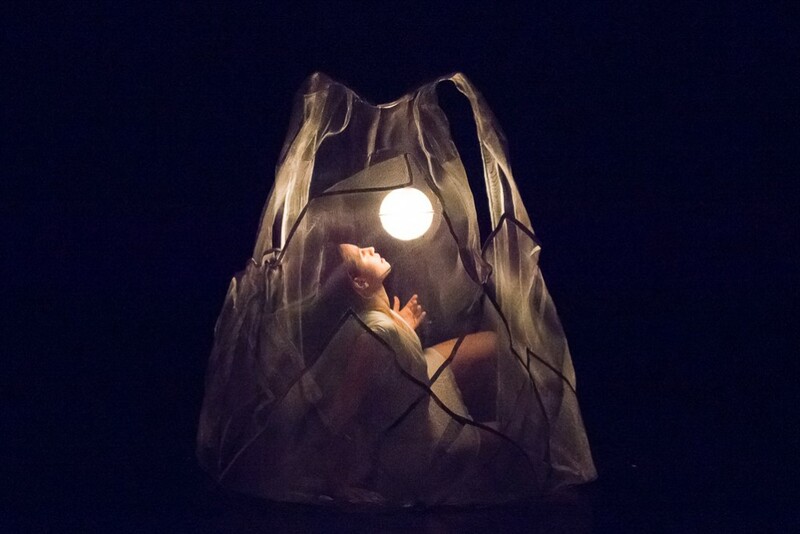 In Shell Games, a play in which choreography substitutes for dialogue, the performers don and shed wire mesh body sculptures that serve as wombs, carapaces or psychological armor, drawing forth images both intimate and apocalyptic. The final piece, the world premiere “Shell Games,” was an incredibly lush visual treat and the evening’s most spectacular work. Small, globe-shaped lights descended from the ceiling into giant seashells made of wire and white, diaphanous fabric. 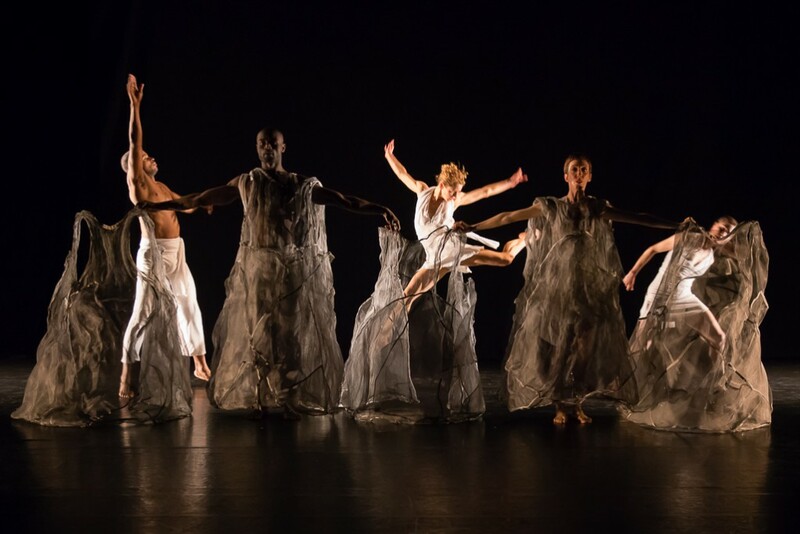 As vocalist Christine Correa sang lyrics by Brion Gysin and Gertrude Stein, dancers clad in white costumes emerged from the seashells and frolicked around the stage. The seashells, intricately designed by Sole Salvo, doubled as set pieces when the dancers shed them. Percussionists Yousif Sheronick and Mark Ferber and pianist Frank Carlberg provided an engaging score for this highly theatrical, gorgeous piece. 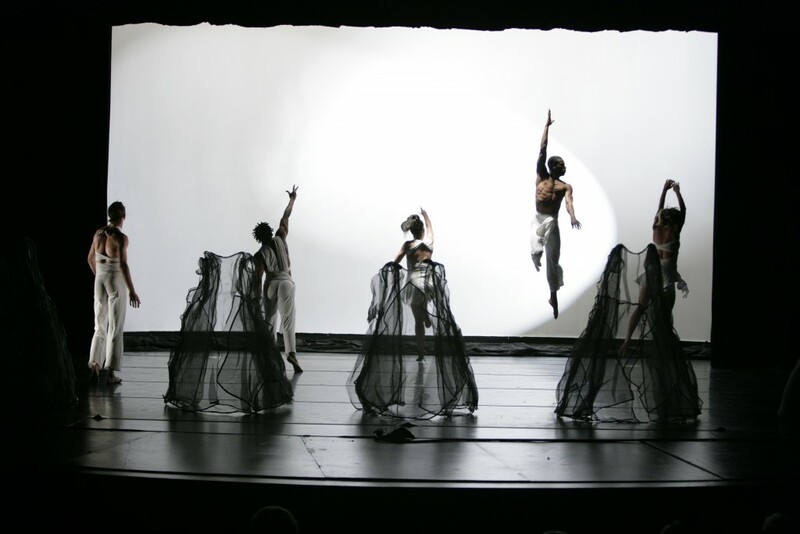 They say you should leave the best to last and “Shell Games,” Hollander’s latest creation, is a wonderful fusion of dance, design and music. It opens with small globe-shaped lights descending purposefully from the ceiling into giant white seashells made from wire and some gauze-like material designed by Solé Salvo. Like small sea-creatures, the dancers, also dressed in white so that they apparently disappear when right inside their shells, then appear to play, dance, converse and even argue with each other, sometimes wearing their shells, sometimes discarding them temporarily before returning to their safety. What is especially clever is that the design of the shells allows the dancers, also dressed in white, to take them on and off with remarkable ease. Not only that, the mix of wire and material means they can stand unsupported when not occupied, thus acting as a part-time set. The work opens to Brion Gysin’s machine poem “I am that I am,” in which that single phrase is repeated many times with the words rearranged in a different order with each reiteration. The piano and percussion score that follows (Frank Carlberg again) provides the perfect accompaniment to this very theatrical piece. If there was a theme running through the evening it was Hollander’s musicality. In conversation a couple of days earlier, he explained that he grew up in a musical family where he learned to play the piano. He was not drawn to dance until he arrived as a freshman at the University of California to study sculpture. Although he then decided to train as a dancer, he soon realised that he true talent was as a dance-maker, where he could bring his love of all the arts to bear. As a choreographer he told me that he is not in the business of scaring people with his work; giving them something they find difficult to understand or come to terms with. If the performance in Taipei is anything to go by that is true. However, his work has variety, is interesting and certainly avoids what my European eyes see as the blandness of some American modern dance. Before the performance I overheard a lady in the row behind say that it had been a long time since she had seen any modern dance and wasn’t sure she would like it. Afterwards she said “what a great evening.” Exactly.